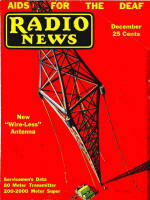 Radio News, founded by Hugo Gernsback, was the most successful radio and technology magazine in broadcasting's first decades. It was published from July of 1919 to April of 1959 under several variations of the title. The first issue of Radio News was published in 1919, as Radio Amateur News; in mid 1920 it dropped the word "Amateur" from the title. In 1948 the title changed again, to Radio and Television News, and from April 1959 to December 1971 it was published as Electronics World. 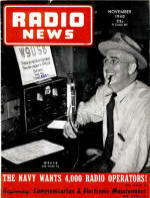 Radio News was aimed at the enthusiastic amateur, but includes a wealth of material that documents the evolution of electronic media in the United States. Gernsback publications paginated continuously by volume. 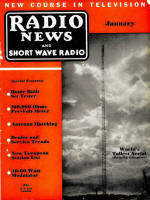 For example, volume 6 of Radio News began with issue no. 1, published in July 1924, and ended with issue no. 12, published in June 1925. The July 1924 issue was paginated 1 -144 and the August issue 145 -280, through the June 1925 issue that contained pages 2193 -2328. Volume 7, no. 1, published in July 1925, resumed with page one. Of all the early radio magazines, Radio News was probably the most widely read, with an advertised circulation of 400,000 by 1925. Although it concentrated at first on circuits and technical topics, what eventually set Radio News apart was the breadth of its coverage. There was something for everyone: amateur radio, equipment, patent news, antennas, broadcasting, radio servicing, DXing, clubs, and program listening. It also had contests, humor, one -act plays, extensive advertising for all kinds of parts, receivers and other equipment, and monthly Gernsback editorials on every conceivable radio subject. It even addressed such arcane questions as whether Esperanto or Ilo was the better international language (it ran a series of Esperanto lessons in 1925)." In 1959 Radio Television News became Electronics World. "Radio Amateur News" in July, 1919. The copyright holder indicated that the copyrights of pre 1964 issues were not renewed.